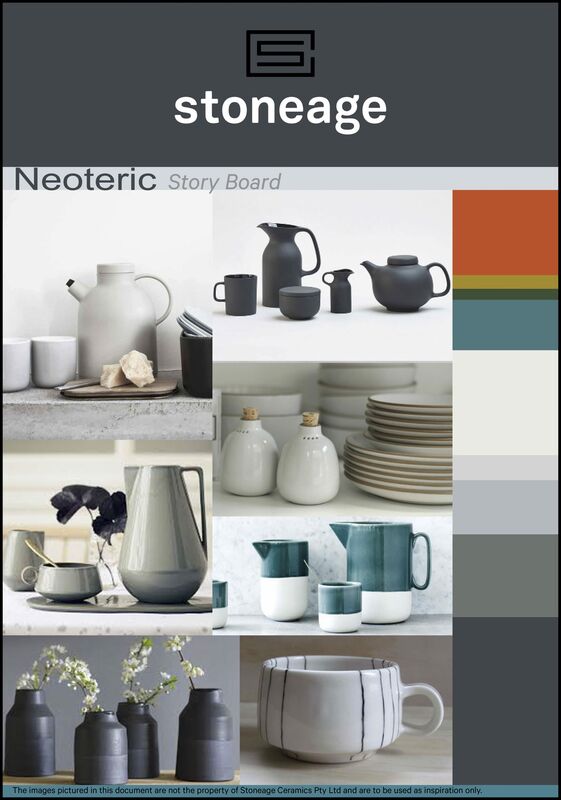 While our designers create new ceramics tabletop collections, exploring fresh ideas, technique and colour combinations, none of our new design concepts have been simply plucked from thin air. Every new collection has a starting point that is based on research and awareness of current and future homeware trends in colour, form and function. 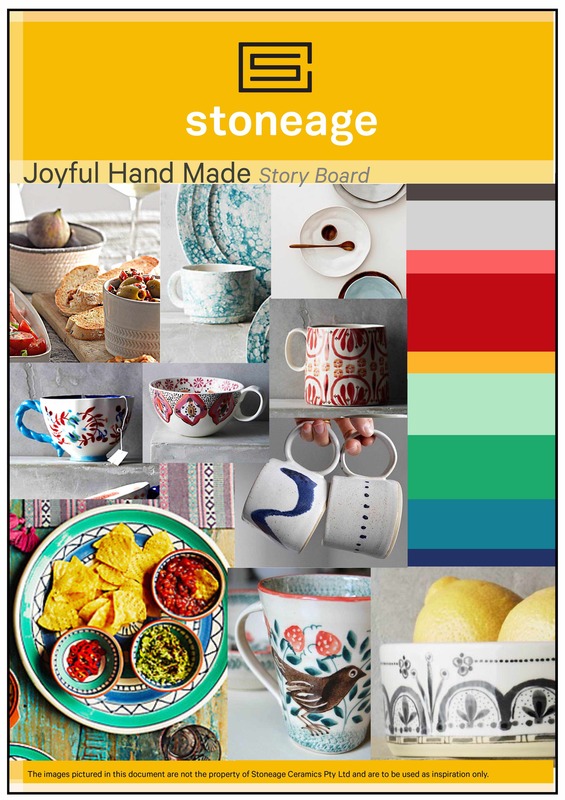 It’s also important to be aware of, and to some degree guided by, current homeware trends as we rely on the commerciality and practicality of our product to drive sales. 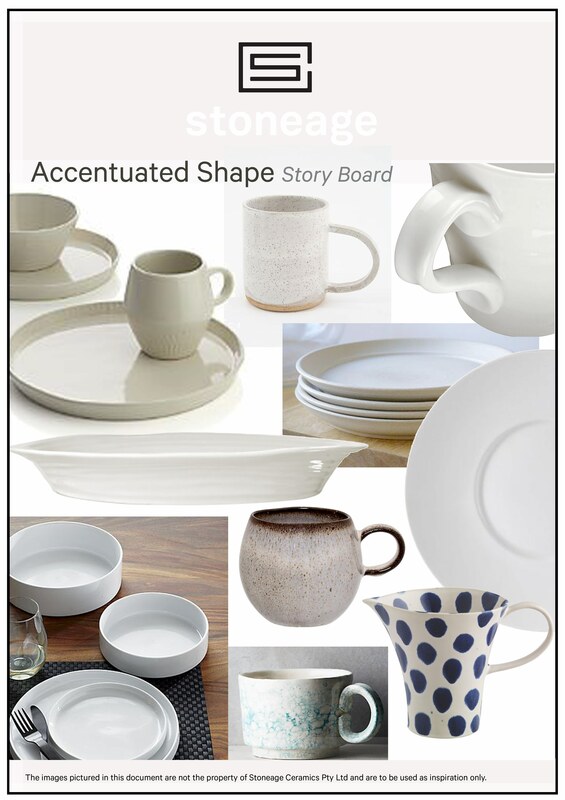 We know that ceramic dinnerware and kitchenware is also only one component of a consumer’s home space and is often purchased to coordinate with glassware, kitchen appliances and soft furnishings to create a collective look. 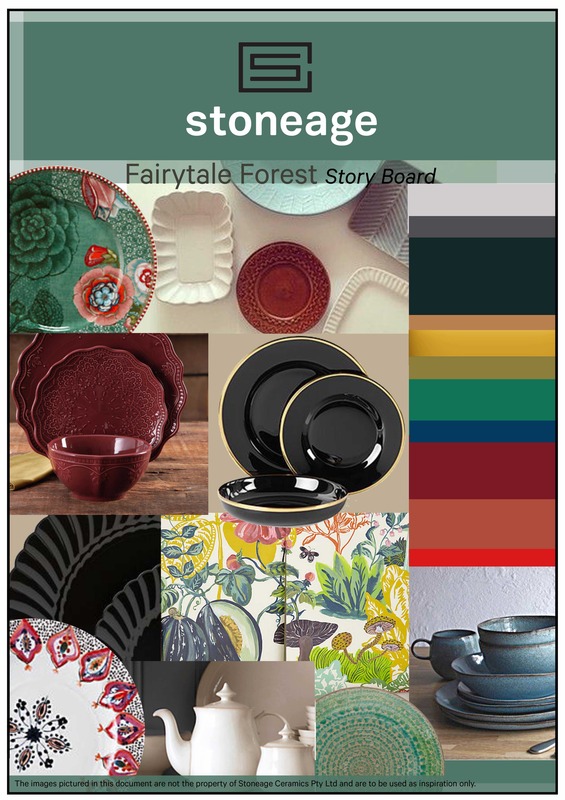 As we begin to make sense of what we are seeing and hearing in the industry, we start to gather imagery and colour information to create our storyboards for the coming seasons. In doing so a visual story appears, as we recognise patterns and a collective theme emerging. This is the starting point and anchor for our design development, which includes new shape design, computer generated pattern and hand painted artwork. 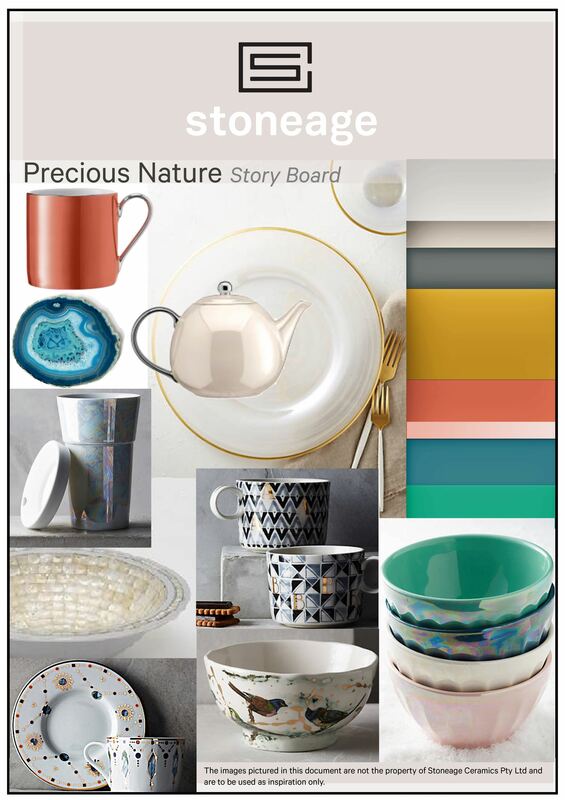 Here we share our 2017/2018 Story Boards, the inspiration for our new season ceramic collections! These boards give an insight into what our design team are seeing and where they are drawing inspiration from as they created the new collections for April 2017. Modern architectural shapes, satin and gloss glazes. Neutral tones accented by pops of dramatic brights. Botanical illustration, watercolour, stamp and hand-drawn flowers of all shapes and styles. 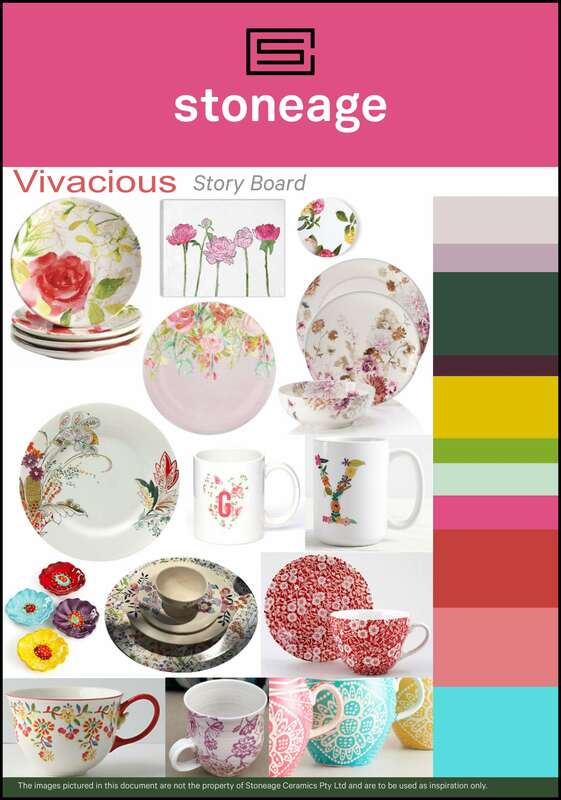 Blooming bright colours to petal soft tones. A vivacious mad bouquet. Playful, tactile shapes with a handmade feel are lovingly decorated with hand painted elements and artistic appeal. Joyous colour and patterns explore traditional themes with a twist. Creatively designed statement pieces with accented, edgy profiles. Very wide rims, flared coupes, and super straight bowls. Playfully exploring handle size, shape and placement. High-end precious metals in gold, silver and platinum accent naïve hand drawn motifs and natural scenes. Taking inspiration from organic natural treasures such as pearl, agate, copper and gold. Strong lines, lofty handles and utilitarian shapes. Calming and thoughtful, crisp and soft white tones. Wild, folk-inspired florals and motifs in deep, moody, saturated colour. Heavy, black, decorative shapes adorned with gold. Tactile and interesting embossed shapes, reactive and crackle glazes and speckle effects. Stay tuned for our next blog post later this month to see the new sell sheets for our latest designs that were based on these storyboards. 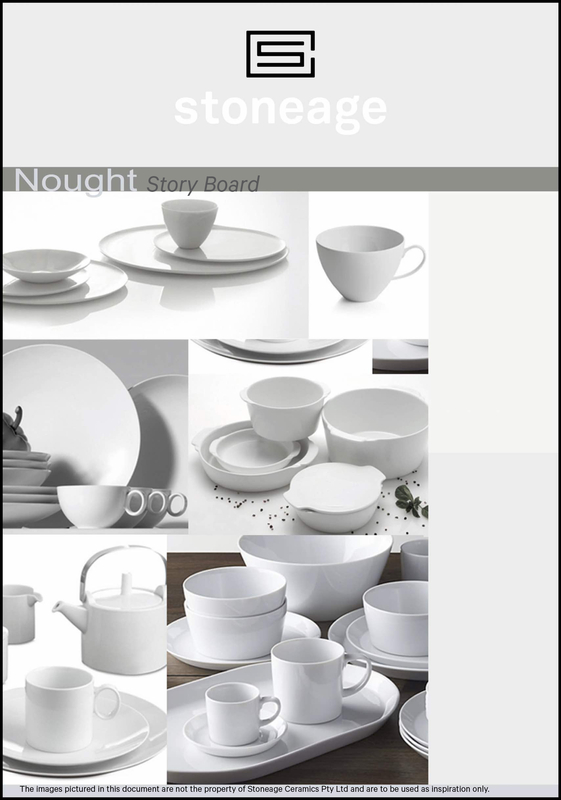 Download a copy of all our storyboards. Get in touch to discuss your ceramic design and production requirements with us.